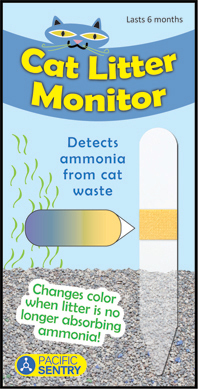 The Cat Litter Monitor is used to determine when a cat litter box needs to be cleaned/scooped or exchanged for fresh litter. If the Cat Litter Monitor is yellow, the litter is clean and still fresh; if the sensor turns green or blue, the litter is dirty and should be cleaned. Have you ever walked into your friends’ or parents’ house and it smelt like a litter box? Many people (especially those of older generations) tend to have difficulty smelling the odors their cat litter box produces because they have become “desensitized” to the smell. This technology eliminates the reliance on smell to determine when the litter box needs to be changed. “Why not just look to see how full the litter box is?” As many people know, simply looking to see “how full” the litter box is unreliable because cats, by instinct, burry their business and urine naturally absorbs downwards so visual inspection of the litter box is ineffective. “Why not just clean it on a regular schedule?” Sure, this is the standard approach which many people rely on, but wouldn’t it be nice to know when the litter needed to be cleaned so you aren’t needlessly cleaning it? Wouldn’t it be reassuring to know that the litter is actually doing its job (reducing odors) and to know when the litter has become “exhausted” and needs to be completely changed? If you would like to know more about what we do, or have other general inquiries, please call (425)-229-9701 and talk directly to a representative. Custom fabrication requests are also welcomed; call or email info@pacificsentry.com for details. We will gladly work with you to design the best solution that meets your needs.